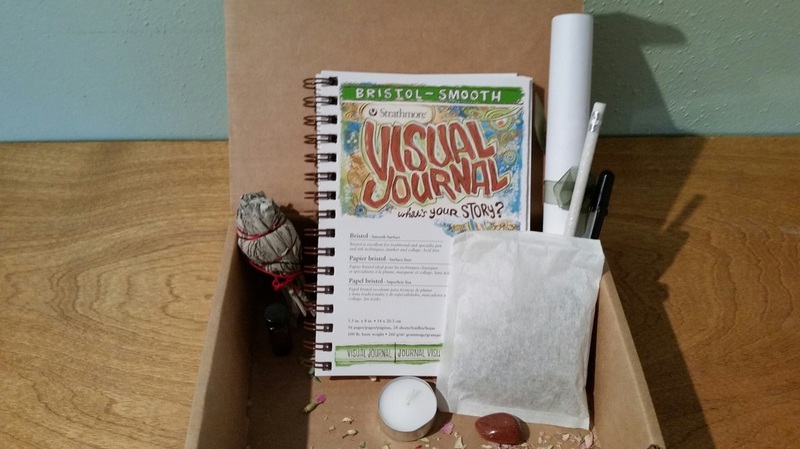 Celtic Wheel of the Year Creativity Kits allow you, wherever you may be, to experience creativity as sacred practice in the comfort of your own home and at your convenience. Each kit is aligned with the ancient Celtic Wheel of the Year holy days, 8 per year, and filled with art supplies, projects and sacred items along with prompts and suggestions to create your own sacred space and inspired projects. Kits are shipped directly to you and I'm always available to answer your questions and provide feedback. Happy Creating! When your kit comes to you in the mail it will be full of creative and magical surprises always with a good sprinkle of sparkle. Each kit also contains information about each holy day allowing you to ground deeper into the ancient wisdom of the Earth. Mother Earth is the ultimate Divine Feminine and connecting with Her promises amazing transformation. Each kit is $50.00. You can order each kit individually, select which ones you want, or receive all 8 at a discounted price using the drop down menu below. Beltane/May Day: This holy day represents the end of the planting season (depending where you live) and is the last of the three springtime festivals focusing on fertility of all kinds; babies and new projects for sure. Beltane marks the arrival of summer and honors light. Beltane, similar to Samhain is a time when the veils between the worlds are thin and magic abounds. This is a festival of joy, rapture and frivolity. Creativity centers on gathering flowers, dancing, and igniting the wild fires of the soul. 2019 orders must be placed by April 16th in order to be received on time. Litha: Summer Solstice is the high of the Solar year and marks the beginning of the descent into darkness. This longest day of the year is a favorite for weddings dating back to ancient times. Creativity focuses on partnerships, sunlight, abundance and the riches of nature. Divination and magic represented by lots of sparkle are also a focus. 2019 orders must be placed by June 8th in order to be received on time. Lughnasadh: This festival is the first harvest and celebrates a full belly. The Feast of Bread is at this time celebrating the ancient great Goddesses of the grain. Creativity at this time is focused on inviting the positive and removing obstacles; garden blessings and fairy magic (a little more sparkle). 2019 orders must be placed by July 16th in order to be received on time. Mabon: Autumn Equinox divides the day and night equally with a deeper nod to the coming darkness. Mabon is the second harvest and we honor the Green Man at this time. Offerings of ciders, wines, herbs and compost are appropriate at this time. Creativity focuses on finery and dining and celebration in a lavish setting. This is the time to finish old business as we are heading into the“cave” time. 2019 orders must be placed by September 7th in order to be received on time. Samhain: This third and final harvest marks the true end of summer as the dark winter commences on this Sabbat. The veil between the worlds is very thin and magic swirls and beckons. Creativity is connected to the dark mysteries symbolized by the Crone. Won't you embark on the magic and mystery of this time between the veils? 2019 orders must be placed by October 12th in order to be received on time. Yule: Winter Solstice is a sacred time to connect with celebration, true love, protecting your home and divine birth. The Full Moon after Yule is considered to be the most powerful of the year. This holy day is a light festival for feasting and dancing. Creativity is focused on the cycle of life, rest and a returning of the light. 2018 orders must be placed by December 3rd in order to be received on time. Imbolc/Candlemas: The Feast of Brigid is celebrated with a festival of lights. The great Goddess Brigid fosters creativity. This is the time of year for purification and acknowledgement of the upcoming spring. Creativity focuses on healing and manifesting your wishes for the year. 2019 orders must be placed by January 14th in order to be received on time. Ostara: The Spring Equinox is an enchanted time where magic joins the forces of light and dark in a very sparkly way. The sun and return of the warmth are solidifying and the seed is placed in Mother Earth. Ostara is a time of fire, balance, fertility and growth. Creativity focuses on the energy of the blossoming spring, rabbits in magic hats and all associated with the egg or seeds. 2019 orders must be placed by March 2nd in order to be received on time. Kits should arrive at your location before the holy/celebration time so that you may plan your creativity process. You may choose to create a huge celebration for others, plan a craft night for your friends or create intentionally in solitude. Please feel free to email manifest_dreams@yahoo.com if you have any questions about your project or kit contents. Enjoy!